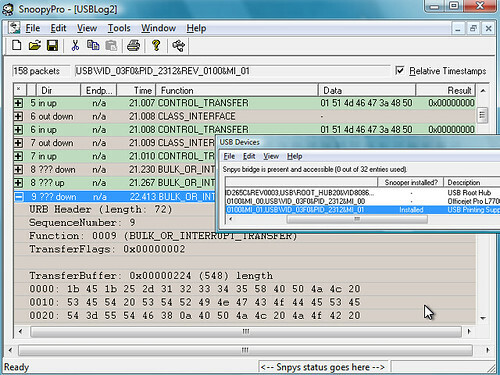 Snoopy Pro is a lightweight USB sniffer tool which does not require any installation. USB (Universal Serial Bus) is connection between the host computer and a number of different external devices like CD drive, camera etc. USB device can be easily connected to the host computer through a USB port, Windows identifies this device and installs a driver for this hardware device which helps in easy communication of the hardware device and host computer. USB sniffers are the free tools used to monitor the USB traffic; that is the activity; happening between the host computer and the various hardware devices which are connected to it via USB. Snoopy Pro is USB sniffer / USB Monitor is a tool which allows the user to analyse and monitor the USB protocol, record and display all the data that is being communicated between the host computer and its various external hardware devices. It works on Windows XP as well. This can be used for software application development, USB device driver, even in the hardware development and at the same time also helps in effective coding, testing and optimization of these applications. Other USB sniffers like USB Monitors are costly; the standard model would cost around $65.00 therefore the advantages of using this tool over other software is obvious. You can download the SnoopyPro from here.